However, the file is already being downloaded before I press the Ok button (i.e. I waited 1 minute before clicking on the Ok button and already 50Mb of 191Mb was downloaded). Does this feature come with any security risks (a malicious file could be downloaded before I even had the chance to click Cancel) and should I find a way to disable it or is this perfectly safe? Technically, the popup does not ask you whether you really want to download the file; that decision, you already took when you clicked on the link which triggered the download. 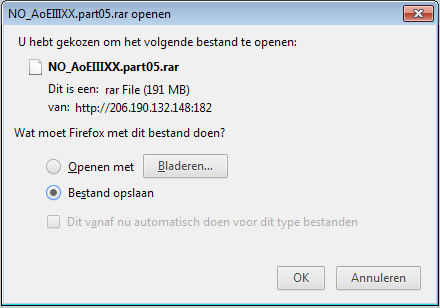 The popup asks you what Firefox should do with the file when it has been fully downloaded. Potentially hostile files can be a security issue. Filesystems normally store files as bunch of bytes and are thus nominally immune to the file contents; but modern operating systems are not content with handling files as files. For instance, if you open a file explorer to see the directory in which downloaded files are stored, and the file has a name which ends in '.jpg' or '.png', then the file explorer will try to interpret the file contents automatically, as a picture, so as to compute and display a miniature view of the said picture. Any security hole in the JPEG or PNG support library could then be exploited by a malicious file, and it does not require any "opening click" on the file, just opening the directory. The Web is a harsh place. To disable it just write about:config in the address bar and search for network.prefetch-next. Set this to false and no pre-downloading should occur. - This does not work on 18.0.2 on Ubuntu or Windows 7, although it is the only method I have found searching the web. I have tried various other settings, nothing worked. It seems that this behavior cannot be disabled. Supposing that the file contains malware, when the pre-downloading is finished, you may receive an alert from your antivirus. As long as you do not open the file, you should be safe. If you clicked cancel, Firefox would just delete the file. Of course, there is always a chance that coupled with a certain vulnerability (in the browser, in the indexing software, etc) an exploit could be built, but I think this is unlikely. A virus scanner might start scanning the partially downloaded file and it could trigger a vulnerability in the scanner. Sophos had some bad press recently. A huge file that is highly compressible would download very quickly and could use up all drive space. Firefox isn't “pre-downloading”. You chose to start downloading by selecting “Save Link As” in the menu, or left-clicking on a link whose content type has no internal or external handler. Once Firefox has started downloading, it prompts you for a save location. As long as you haven't entered that location, it downloads the file to a temporary directory (platform-dependent), either with the server-supplied default file name plus a .part suffix or with a randomly-generated file name (I think that depends on the version, perhaps on the platform as well). Firefox needs to start downloading before prompting you for a file name, because the default file name can be supplied by the server: the original link could be a redirection (so Firefox needs to initiate the connection and read the response code, and there could be a file name in a Content-Dispotition header (so with a 200 response, Firefox needs to read the headers). There is no security risk here. When you click on something in a browser, it is expected that the browser will establish a connection and download the content at that link. Sure, there could be security issues (e.g. the content may trigger an exploitable browser bug), but that is a risk that you take by using a browser in the first place. To have every click in a browser pop up an “are you sure?” dialog box would be a usability nightmare, with no security benefit since you'd be clicking “yes” all the time anyway. Ok, Firefox could pause the download after the headers. But that wouldn't serve any useful purpose (in addition to being bad for performance and usability). The exploit could be in the headers, after all. Not the answer you're looking for? Browse other questions tagged windows firefox or ask your own question. Can a rogue .wmv file “hijack” Windows Media Player? Firefox jetpack store.json stores all my visited domains! How safe is Firefox Developer Edition?